Looking to buy a crossover SUV in the Merrillville area? Stop by Bosak Honda in Michigan City to test drive a used Honda CR-V! This crossover, like every other Honda model, is packed with tons of great features and gets great gas mileage. Plus, it’s spacious, safe, and versatile! 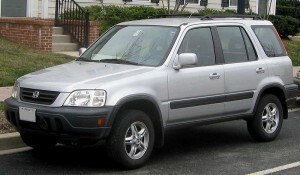 Traditional SUVs offer plenty of space for cargo and passengers, but they tend to fall short in terms of fuel economy. Even some crossover SUVs earn only passable fuel efficiency ratings. The Honda CR-V, however, is about as efficient as they come. Used models from 2012 or later offer an EPA-estimated 23 mpg in the city and 31 mpg on the highway for a combined rating of 26 mpg. Earlier models get around 21 mpg in the city and 28 mpg on the highway, so no matter which CR-V model you choose, it’ll take you farther with each tank of gas. The CR-V is also one of the highest-scoring compact crossover SUVs in a variety of crash tests. The NHTSA has awarded every recent model of the CR-V with a perfect five-star score, while the IIHS has consistently awarded the CR-V their highest rating of “Good” in tests including frontal offset, side impact, and roof strength. Each CR-V model also comes standard with an array of great safety features. Antilock disc brakes, traction and stability control, side airbags, and active front head restraints are just a few of the great features that come standard on many CR-V models. Features like air conditioning, cruise control, power accessories, and a stereo system are standard equipment on every CR-V, while newer models add on amenities like automatic headlights, an infotainment display, rearview camera, and Bluetooth connectivity. Test Drive a Used Honda CR-V Today! Here at Bosak Honda near Merrillville, you’ll find a wide selection of quality used vehicles including the Honda CR-V. Want to know which models are currently in stock? Just take a look at our online used car inventory, or give us a call at (800) 728-9825. Of course, you can always just stop by if you’re in the area – our friendly sales team can help you find the perfect used car!